Small Candy pot - 3" (76 mm) high. Frank Candy set up his pottery, Candy & Co, in 1850 at Newton Abbot, Devon. It remained in his hands until 1880 when it was taken over by J Howard Fox. Originally a tile works, production of an art pottery line began after the First World War and was marketed under the brand name 'Wescontree Ware'. 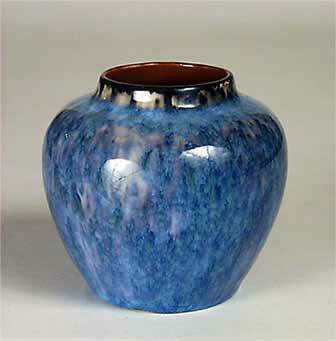 The pots were slip cast, and decorated with glaze effects. The 'Wescontree' name was changed to 'Candy Ware' and in 1936 a thrower, Sidney Dart, took over the making of the hollow wares which was continued until 1960. Meanwhile, production of tiles went on and in the 1980s the firm produced a range based on the designs of William de Morgan. The company closed in 1991, but in 1998 the premises were bought by British Ceramic Tiles Ltd who are still manufacturing tiles.